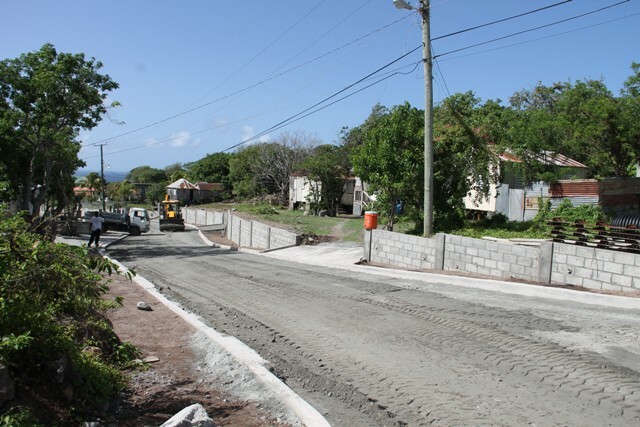 NIA CHARLESTOWN NEVIS (July 14, 2016) — Major works in the Hanley’s Road Rehabilitation Project are slated for completion by the end of July. Up to the end of June, 2016, the project remains on budget. The multi-million dollar venture commenced on March 18, 2015, under the supervision of the Public Works Department (PWD). Hon. 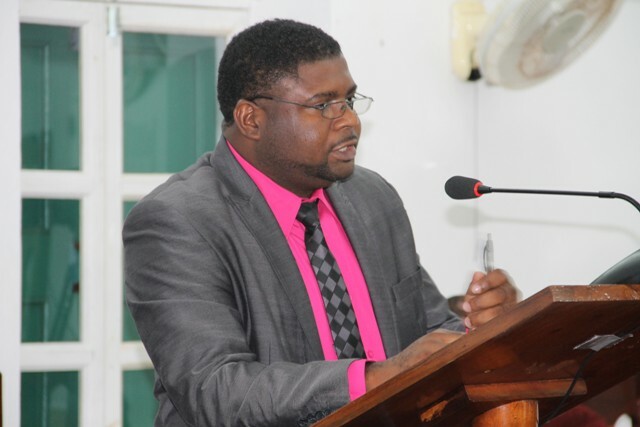 Troy Liburd, Junior Minister of Communication and Works on Nevis, with special responsibilities for Works and Public Utilities, Posts, Physical Planning, Natural Resources and Environment, released the information while presenting a status report of the project at a sitting of the Nevis Island Assembly on July 12, 2016. “Major works on Hanley’s Road should be completed by the end of this month,” he said. Mr. Liburd added that final grading works were ongoing on a stretch of road from the community centre at Middle Works to Holmes Hill which was slated for paving later in the week. The final layer will then be applied to the stretch of road. The Minister used the opportunity to reiterate the project’s importance to the people of Nevis. He said it has provided employment for more than 80 tradesmen and labourers, more than 20 truckers and 12 service providers. Material excavated from the project has been utilised in public areas including ball fields at Hardtimes, Bath, Ball Pasture (St. George’s recreation ground) and the Gingerland recreation ground. “Boulders excavated from the road have been utilised at the Hardtimes playing field and along the road at Rawlins Village. “The vast majority of the excavated waste material has been trucked to the Indian Castle Race Track to assist the Nevis Turf and Jockey Club in improving their track as they seek to revive horse racing on the island,” he said. During the road works, the ball field at Middle Works was levelled to provide the people of Hanley’s Road with a proper field for sports. A public bus stop has also been installed there. 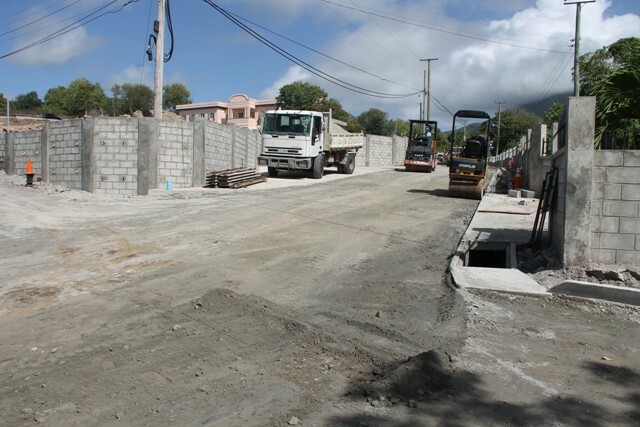 According to Minister Liburd, to date, 8,000 ft. of road has been excavated which produced 23,000 cubic yards of material used in other areas; more than 8,000 feet of new water distribution lines have been laid; new service connections, fire hydrants, and pressure reducing valves have been installed. He added, more than 12,000 ft. of curbs and curb slipper have been laid; more than 300 ft. of covered U drain installed and more than 1000 tons of hot asphalt mix has already been placed. Mr. Liburd also noted that in areas where cuts were made into adjacent elevated lands, retaining walls were built. Fencing has been replaced and 25,000 ft. of masonry retaining walls have been constructed. The Minister used the opportunity to commend the people of Hanley’s Road and surrounding areas, for their unwavering support to the project, their patience and understanding. “We have had to take in lands in some areas. We have had road closures, water outages and through it all, the people of Hanley’s Road have been most kind and accommodating. I very much appreciate that,” he said. Mr. Liburd also commended the permanent secretary and ministry staff, staff at the PWD and the Nevis Water Department for their hard work on the project.